Street art in Seine-Saint-Denis is not just confined to the department. 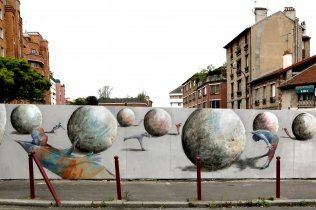 The artists have also brought graffiti art to the streets of the North-east of Paris, from Seine Saint Denis to the 11th, 18th and 19th arrondissements in Paris. From Bagnolet to Aubervilliers and Montreuil, via Oberkampf, Stalingrad or Ménilmontant. Streets artists sometimes work alone or together, the latter can be termed as Crew. Even though some Crews have their own territory, some graffiti artists and streets artists are often on the move and redesign an urban landscape modelled to their own image.